As you know, I don’t usually do brunches, but when there is something special to entice me, I can make the exception. 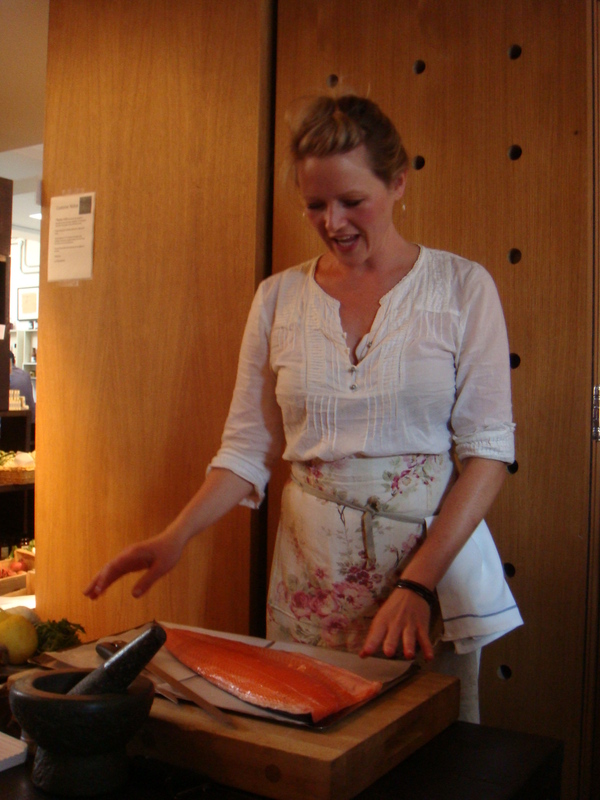 Brunch with Alice Hart at La Fromagerie is that sort of exception. Alice seemed a little nervous, in front of this small group, but was sweet, warm, friendly and seemed driven by the thoughts of an environmental, food enthusiast. Alice’s Cook Book is really not any old ordinary cookbook, but a part of the New Voice In Food series from Quadrille Publishing, supporting new talent in the food world. 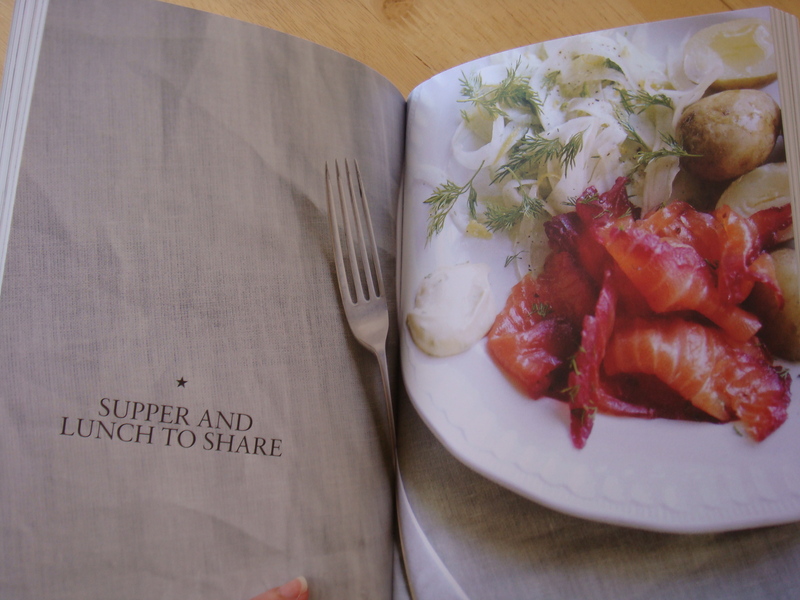 I wasn’t sure about the format of the book when I first saw it but the titles of the recipes drew me in. 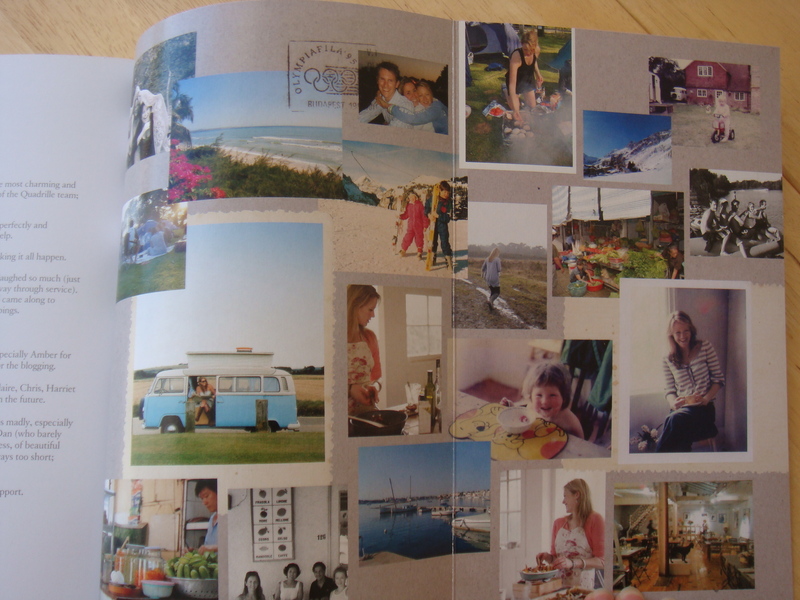 I soon began to enjoy the arrangement of the recipes into picnics, camper vans, seasonal Sunday lunches etc. It began to be a story and I could see that Alice had put alot of herself into this book. 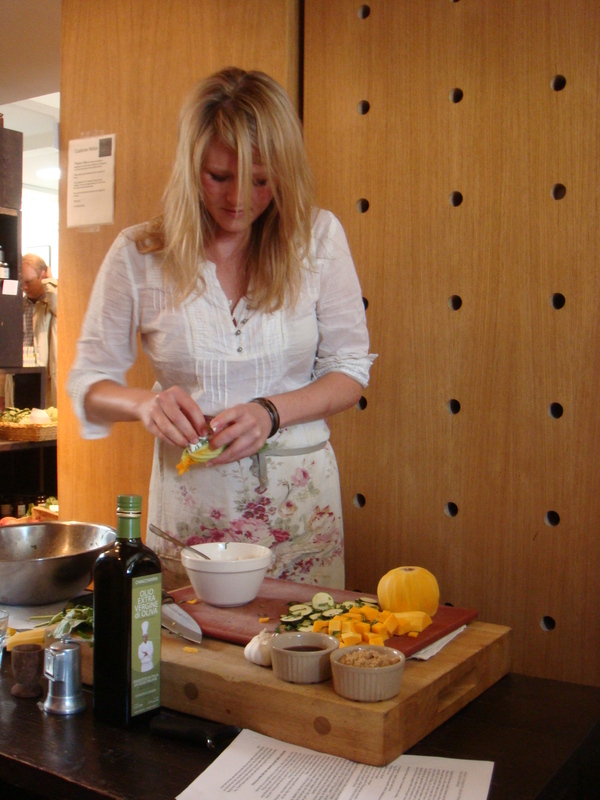 Alice demonstrated a few recipes from the book, discussed her inspiration and enthusiasm for her first cookbook. 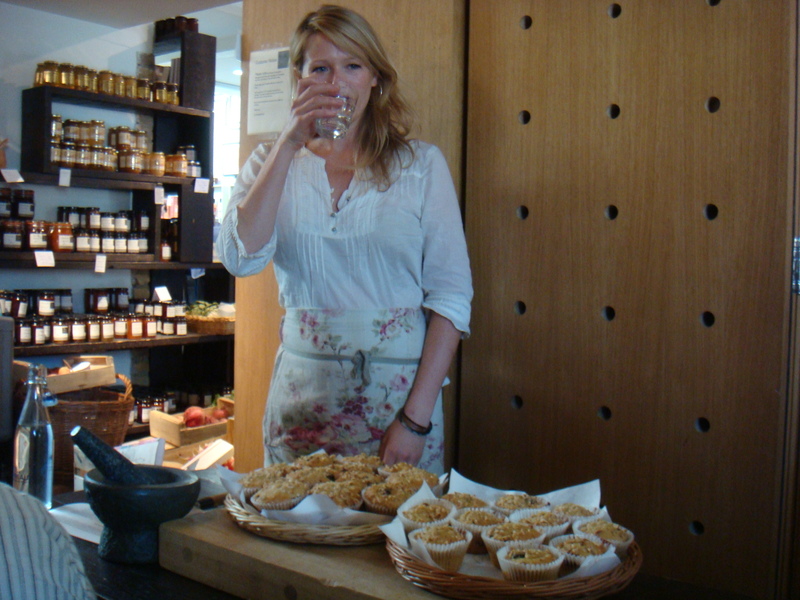 The first offering was Blueberry and Granola Muffins. A light muffin made on a wholemeal/plain flour mix, yoghurt, granola and berries. Easy enough and tasty too. 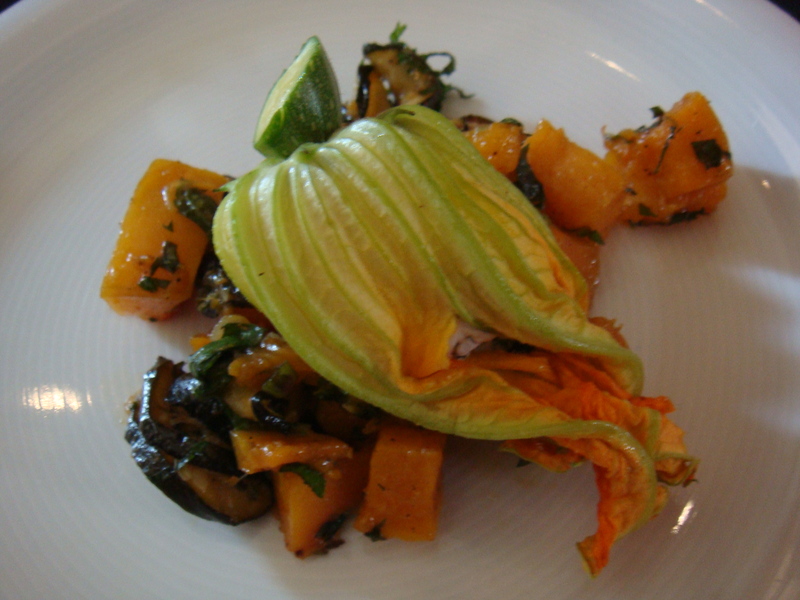 Alice then demonstrated her Roast Courgette and Butternut Agrodolce with Stuffed Courgette Flowers. She really made each dish look easy to do. The courgette and butternut mix was brought together by the agrodolce (sour/sweet), beautifully balanced flavours of sugar and red wine vinegar . La Fromagerie had, of course, supplied an amazing fresh goats cheese with a distinctive citrus flavour. This balanced the dish very well. Our next brunch treat was something which had caught my eye in her book too. 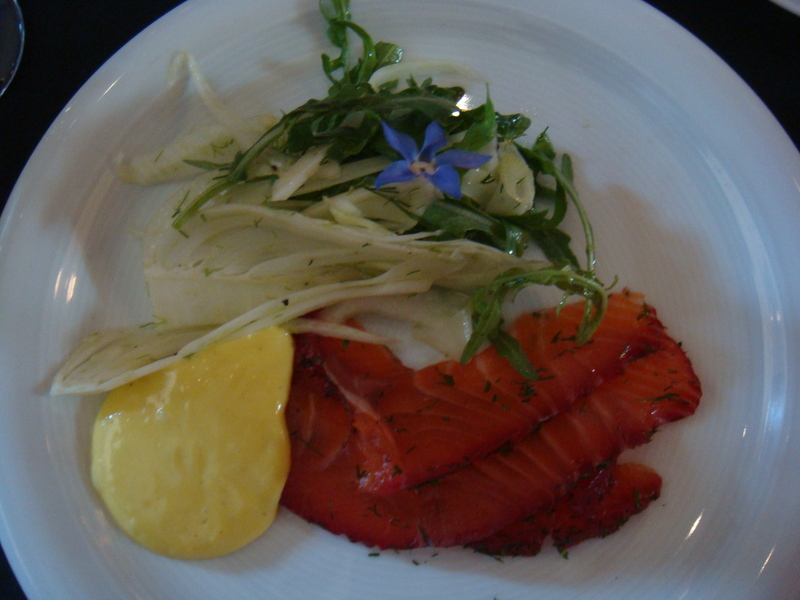 Beetroot-Cured Side of Salmon with Aioli and Shaved Fennel Salad. It is a really beautiful dish. Curing the salmon is an incredibly easy preparation. Aioli, sounds difficult but only requires one strong hand and one gently pouring one (or a food processor!). La Fromagerie had added some borage flowers which had a delicate cucumber taste. A great dish for a party of friends on a summers day. Our final taste from Alice’s Cook Book was a Mocha Affogato. 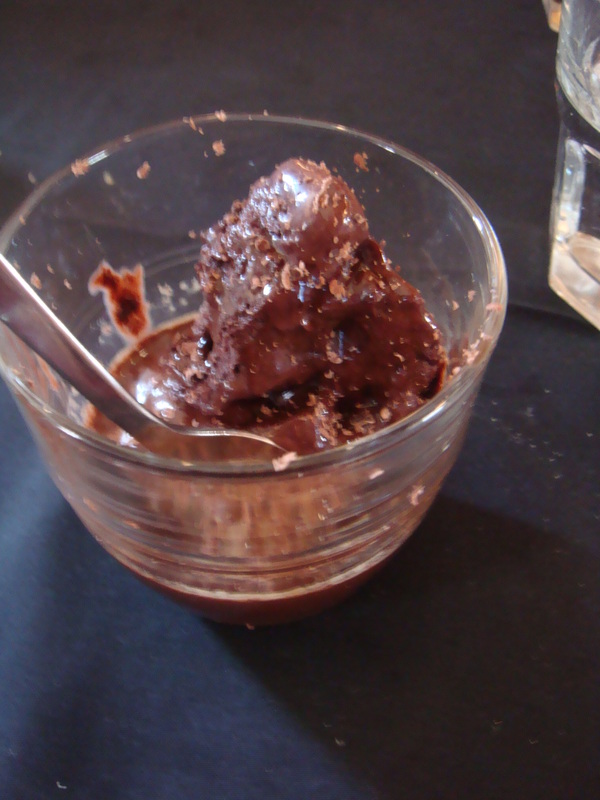 A complete hit of chocolate icecream, from The Ivy House, with the signature La Fromagerie coffee, Le Piantagioni, poured hot over the top. 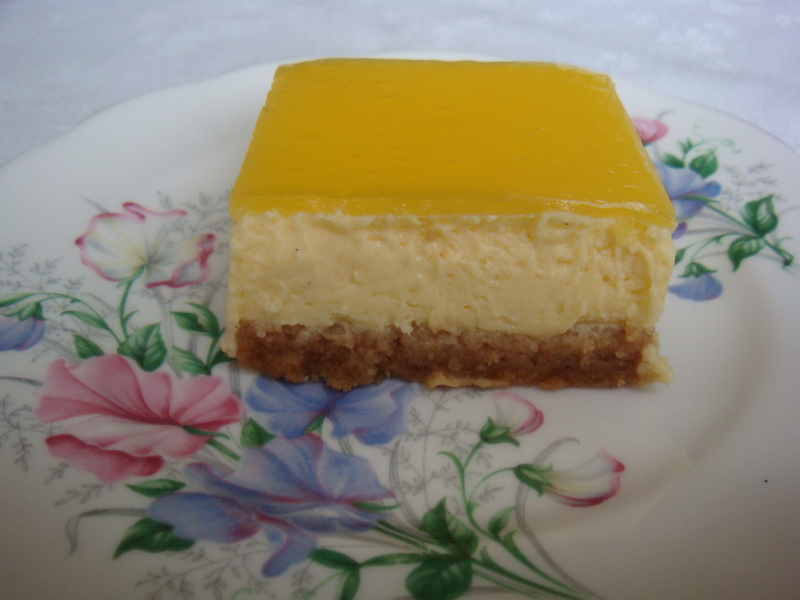 We have a much loved family recipe from my late paternal grandmother for Passionfruit slice. She kept it a secret and all the women were trying to coax it out of my Aunt after her passing. I think my sister now has a copy. So I was curious to try this version to see how it stands up. mango or pineapple to serve. Preheat oven to 160*C. Line 20x30cm, 6mm deep, tin or dish, with parchment paper. Place the biscuits in a food processor until finely crushed. Add the melted butter and pulse briefly, then press into the tin. Bake for 10mins and set aside. Beat cream cheese in a large bowl until smooth. beat in eggs, yolks and cornflour, then the sugar and passionfruit juice and vanilla. Don’t over mix, as too much air will cause the cooked cheesecake to crack. Pour over biscuit base and smooth the top. bake for about 30 mins, until wobbly in the centre but not brown on top. Turn off the oven and leave to cool with the door open for 15 mins ( to minimise cracking). remove from oven and set aside to cool completely before chilling in the fridge for at least an hr. To make the topping, soak gelatine in cold water to soften. Heat 4 tblp of the orange juice with the sugar until simmering. Remove from heat and stir in the gelatine sheets. Add the remaining orange juice and passionfruit pulp or juice. Chill for 20mins, then pour over cheesecake and return to fridge for at least 4 hrs, preferably overnight. 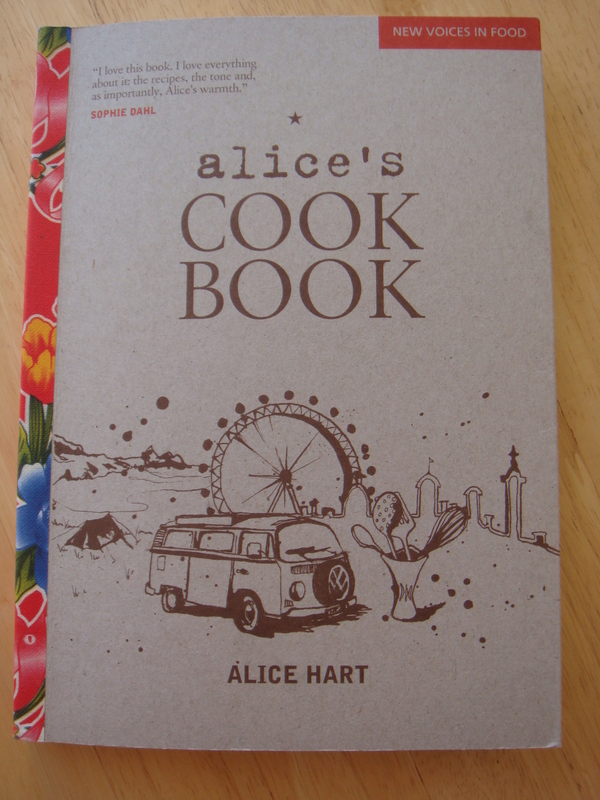 Thanks to Quadrille Publishing for providing Alice’s Cook Book.